Different than an audio book, you’ve probably heard old time-y radio theater and loved how the full cast of voice actors, cool sound effects, and the musical score just brought a production to life like nothing else could. Well, Andy Smithson just made his way to audio drama! 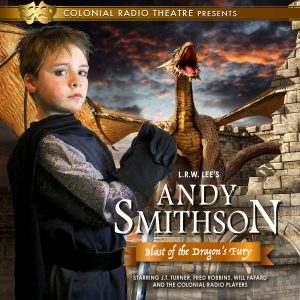 Seeing the adventure that the Andy Smithson series is, Colonial Radio Theatre approached me a while ago about turning the series into an audio drama. To say I was honored would be an understatement. These guys have been doing award-winning audio dramas for-ever. And they approached little ol’ me? About Andy? Heck yeah! I was blown away the first time I heard the original musical score they wrote to accompany this production. If you like Harry Potter, you’ll definitely love this music. But the entire production is amazing! The original music score they wrote is pure genius! I absolutely love how it draws me in every time I listen to it. The wide sweeping score gives it an epic feel and the tinkling of the bells/triangle creates expectation while the percussion/horns tell me I will soon be knee deep in danger, action, and adventure right along with the characters. Perfection that everyone is sure to love! They just released Blast of the Dragon’s Fury and are well under way with Venom of the Serpent’s Cunning which they hope to release this Fall. So if my excitement hasn’t created a big enough build up…have a listen to some epic clips on my website. Then go buy it! I promise you’ll absolutely love the action, adventure and music! Oh my goodness, Linda, this is absolutely AWESOME!!! I have got to get one of these. Next Next post: Battle for the Land’s Soul Just Launched!